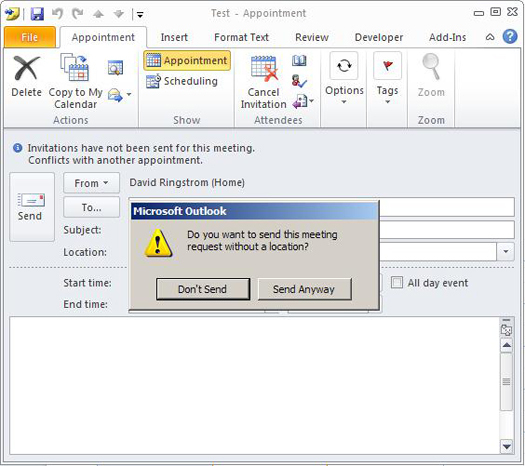 Microsoft Outlook: Disabling the Send without a Location Prompt » Accounting Advisors, Inc.
Outlook often tries to be helpful and alert you when you've left the Location field blank within a meeting request. However, often the meeting location is implicitly known or isn't necessary, such as for a phone call. In this article, I'll demonstrate how you can eliminate the prompt shown in Figure 1. You can adapt this technique to prefill other fields within Outlook forms as desired. Figure 1: A simple form customization in Outlook can eliminate this prompt. 1. For all versions of Outlook: Select your calendar in Outlook. 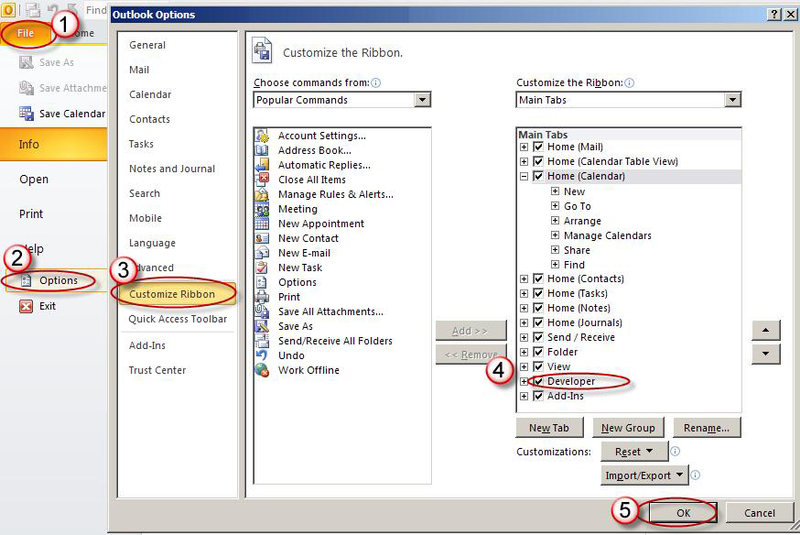 Outlook 2010 and later: Turn on the Developer tab by choosing File, Options, and then Customize Ribbon. Click the Developer checkbox, and then click OK, as shown in Figure 2. Click the Design a Form button on the Developer tab, as shown in Figure 3. Outlook 2007 and earlier: Choose Tools, Forms, and then Design a Form. Figure 2: Enable the Developer tab in Outlook 2010 and later. 2. 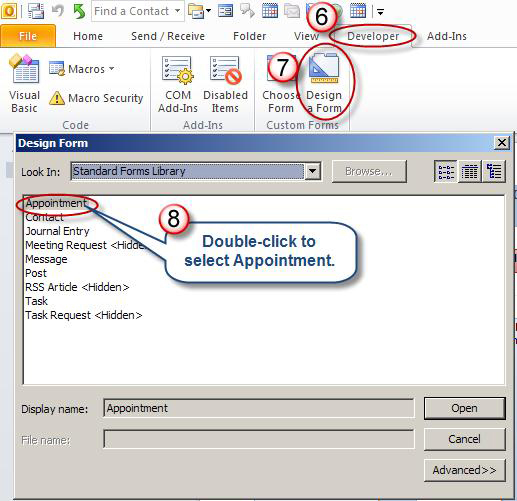 Double-click on Appointment in the Standard Forms library, as shown in Figure 3. Figure 3: In Outlook 2010 and later, Design a Form appears on the Developer tab. 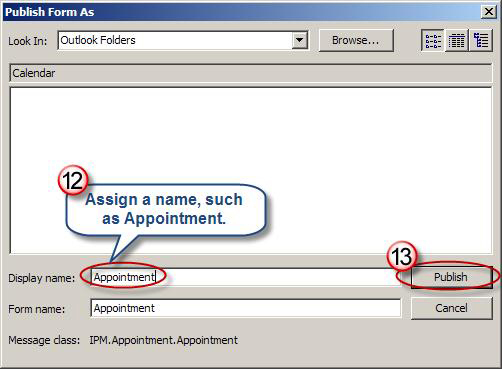 Double-click on Appointment in all versions of Outlook. 3. Fill in a location, such as (none), as shown in Figure 4. 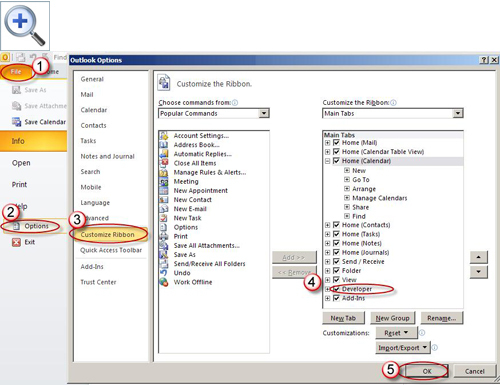 Outlook 2007 and later: Click Publish and then Publish Form, as shown in Figure 4. Outlook 2003 and earlier: Choose Tools, Forms, and then Publish Form. Figure 4: Publish the form after adding text in the Location field. 4. 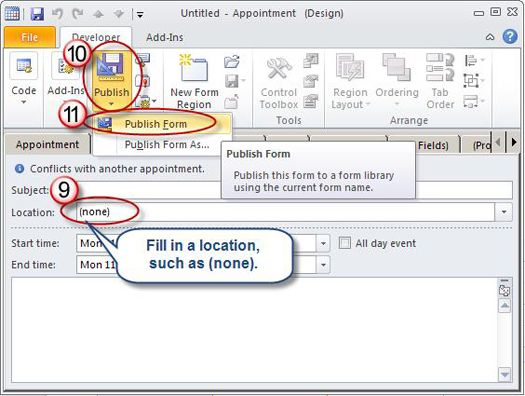 Assign a Display Name, such as Appointment, and then click Publish, as shown in Figure 5. Figure 5: Assign a name to your custom form. 5. Close the form window, and click Yes to save if prompted. 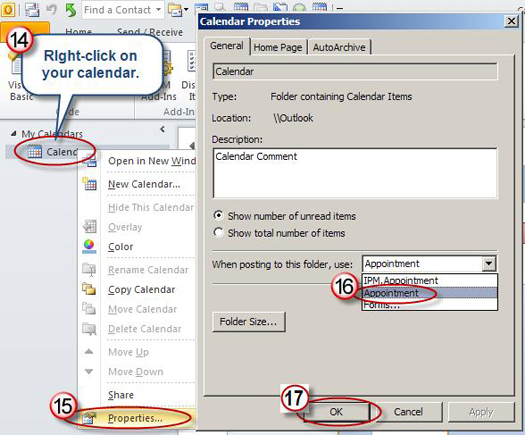 Right-click on your calendar (underneath “My Calendars” along the left-hand side of Outlook) and choose Properties, as shown in Figure 6. Select the form that you just created from the “When posting to this folder, use” drop-down list, and then click OK. The built-in Outlook forms have a prefix of IPM; any forms that you customize will not have this prefix. Figure 6: Make this new form the default for your Calendar. Going forward, the Location field will be prefilled with the text of your choice, and you'll no longer encounter the dreaded “Send meeting request without location” prompt.